Released 28 April 2006 in Japan only as a double DVD set, and due for reissue on the Universal label in 2013. Subsequently reissued as a Highlights CD/DVD as part of 'The Cosmos Rocks' on 15 September 2008. Length 142 minutes (disc 1) and 25 minutes (disc 2). Recorded at the Saitama Super Arena, Tokyo, Japan, on 27 October 2005. This Japanese-only release is only available on the NTSC format, and comes in a standard plastic case, with an OBI strip, a black and white lyric booklet (with lyrics in Japanese and English), and a gold booklet containing the tracklisting, credits and photos. Both DVD's contain black and white menus which contain an excerpt of audience noise. 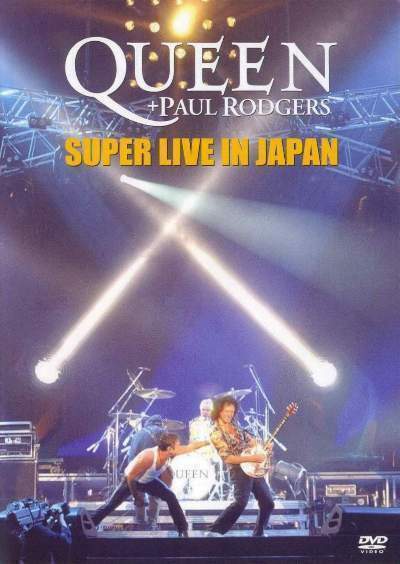 The concert was previously broadcast (seemingly unedited) on Japanese TV on 31 December 2005. The DVD, packaging and promotion make no reference at all to Eminem's 'Lose Yourself' which is the first track of the concert (played from tape). The first DVD features the concert, and allows you to play the entire concert, select a song, or change the setup. When it loads, the concert is played with a mini-menu at the bottom, with options of Play In Stereo, Play In 5.1 or Main Menu. This mini-menu is shown for around 90 seconds and then disappears, and the concert continues. The main menu has a black and white design, and contains four options, Play Concert, Song Select, Setup and Resume. The song selection options are arranged over three silent menus, whilst the setup menus allow you to select between stereo, 5.1 surround sound, English subtitles, Japanese subtitles, or turn subtitles off. The second DVD is a 'Backstage In Budapest' 25 minute documentary, which features new interviews with Brian May, Roger Taylor, Paul Rodgers, Spike Edney, Jamie Moses, Danny Miranda, Laszlo Hegedus (Queen's promoter for the 1986 Budapest show) and James 'Trip' Khalaf. It features footage of the city of Budapest, the Nepstadion, the venue, the stage being built and of the band backstage and meeting fans. The interviews in the programme cover numerous topics, including Paul Rodgers, Queen's songs and back catalogue, the city of Budapest, the tour, first performing together, audiences, and the future. The programme also contains excerpts from the album versions of a number of Queen songs, and also contains short excerpts from live performances of 'Tie Your Mother Down', 'All Right Now' and 'The Show Must Go On', as well as excerpts from the soundcheck and a short backstage blues improvisation of 'Wishing Well'. The programme is shown automatically when the DVD loads. The menu contains only two options - Play Programme and Subtitles, which allow you to select Japanese or English subtitles, or turn them off. This disc contains a very basic menu, with just a simple song select screen. The start features Japanese titles followed by English titles, and it does not feature any credits at the end. Chapter 1. Song length 2:21. This Eminem track is played from tape, and the explosion at the end segues into 'Reaching Out' and extends the time to 2:28. This track is not mentioned on the DVD, packaging or any of the promotion. Details of the original version can be found on the 2005 Tour Downloads page. Track 2. Song length 1:00. Lead vocals by Paul Rodgers. This track segues from the explosion of 'Lose Yourself' and into 'Tie Your Mother Down'. The 'Highlights' CD/DVD contains the full version of this track. Details of the original version can be found on the Brian May Collaborations page. Chapter 3. Song length 4:53. Lead vocals by Paul Rodgers. This track segues from 'Reaching Out'. The 'Highlights' CD/DVD includes an edited version of length 4:26; it loses the sections from 3:29 to 3:36 and 3:55 to 4:15, but includes Paul's dialogue at the end. Chapter 4. Song length 5:41. Lead vocals by Paul Rodgers. The above time includes a guitar intro (length 0:33), which means the actual song time is 5:08 (from the first vocal). The 'Highlights' CD/DVD includes an edited version of length 5:14 (the actual song itself is 4:43), which loses the section from around 3:49 to 4:15, and Paul's dialogue at the end. Chapter 5. Song length 3:53. Lead vocals by Paul Rodgers. Chapter 6. Song length 3:46. Lead vocals by Paul Rodgers. This track was later released as the B-Side to the 'C-lebrity' single. The 'Highlights' CD/DVD contains the full version of this track, but it loses the dialogue at the end. Details of the original version can be found on the Paul Rodgers Songs page. Paul: Thank you so much. That was a little song I wrote with a band called Free, when we first came to Japan sometime in like, I don't know, was it 1970 or something? Thank you. Brian: Ladies and gentlemen, in case you didn't know, from England, the legendary, Mr Paul Rodgers. Chapter 7. Song length 4:14. Lead vocals by Paul Rodgers. The 'Highlights' CD/DVD includes an edited version of length 4:02, which loses the section from around 3:09 to 3:22, and also Paul's dialogue at the end. Roger: Oh, Tokyo. Arigato. Fantastic. OK, we have a very soft, sad song, written for Nelson Mandela, and his fight in Africa and the world against HIV/AIDS virus, and, er, like to dedicate this one tonight to Freddie. Chapter 8. Song length 2:40. Lead vocals by Roger Taylor. Details of the studio version can be found on the 'The Cosmos Rocks' album page. Roger: Thank you. Ladies and gentlemen, (laughs), we call him Miranda, from Brooklyn USA, on the bass and the guitar, Danny Miranda. And a real bad man over here, Mr Jamie Moses on the guitar. Up here, the keeper of the keys, the wizard, Mr Spike Edney. Brian May. Brian: Ahhh, (speaks in Japanese). Are you sure? Ha, ha. OK. Um, we used to say this in the old days when Freddie was around, um, I would like to say (speaks again in Japanese), because, I'm gonna need all the help I can get, OK? You help me? Chapter 9. Song length 1:46. Performed by Brian May. Brian: Yes, please clap, thank you. You can sing aswell if you want. Brian: Yes, very nice. Ah, fantastic (speaks in Japanese), hey. You guys are wonderful, you wanna sing some more? Have to say, I got a funny feeling singing that song because I know that I did sing that to some of your mothers a few years ago, I'm very happy that we're all here today and we can still enjoy this stuff. Thank you for being here. OK, I think most of you know, this song is for Freddie, and this song is by Freddie, and I think, one of his most beautiful songs ever, and it doesn't matter if I sing it, and if I sing it badly, it doesn't matter, it's still a great song, so we sing it all together and we'll sing it beautifully, OK? Chapter 10. Song length 4:20. Performed by Brian May. The 'Highlights' CD/DVD omits this song but includes Brian's dialogue at the end. Brian: (speaks in Japanese) is fantastic. Thank you people of Tokyo. Brian: Those of you who were here last night, anybody here last night? Ahh, everybody, OK, ha, ha. In that case, you know what this is, and you will be a, you will be a, fortunate, I hope, to witness the second time we will play this song. And it goes like this, this is reaching back a long way too, and er, I have to again say, thank you for all the years, thank you, Japan. Chapter 11. Song length 5:09. Lead vocals by Brian May and Paul Rodgers. Chapter 12. Song length 3:42. Lead vocals by Paul Rodgers. This track contains only the fast part, as the slow part was not performed. Chapter 13. Song length 6:36. The above time includes the slow intro (1:08) and the actual song (5:28). Lead vocals by Paul Rodgers. Chapter 14. Song length 3:19. Performed by Roger Taylor, with accompaniment from the rest of the band. This track does not include any lyrics or dialogue. Chapter 15. Song length 3:13. Lead vocals by Roger Taylor. Chapter 16. Song length 10:10. Performed by Brian May. This track does not include any dialogue or lyrics. Chapter 17. Song length 4:23. The above time includes the slow intro (0:35) as well as 'Last Horizon' itself (3:48). This track does not include any dialogue or lyrics. Details of the original version can be found on the 'Back To The Light' album page. Chapter 18. Song length 4:34. Lead vocals by Roger Taylor. The 'Highlights' CD/DVD includes an edited version of length 4:25, which loses some of the instrumental intro, from around 0:09 to 0:18. Chapter 19. Song length 5:37. Lead vocals by Roger Taylor and Paul Rodgers. The 'Highlights' CD/DVD includes an edited version of length 4:09, which loses the section from around 1:27 to 2:55. Paul: Roger Taylor there, alright. Here's a love song that I recorded with Bad Company many years ago, it's one you might like to join in with, it's called I can't get enough of your love baby. Chapter 20. Song length 4:45. Lead vocals by Paul Rodgers. The 'Highlights' CD/DVD includes an edited version of length 4:26, which loses the section from around 3:00 to 3:15. Chapter 21. Song length 6:26. Lead vocals by Paul Rodgers. Chapter 22. Song length 4:07. Lead vocals by Paul Rodgers. Paul: Thank you, you're beautiful, oh. Chapter 23. Song length 5:03. Lead vocals by Paul Rodgers and Brian May. Chapter 24. Song length 5:56. This track contains vocals by Freddie Mercury from Live At Wembley (recorded on 12 July 1986), the original promo video, and live vocals by Paul Rodgers. Chapter 25. Song length 2:30. Lead vocals by Brian May and Roger Taylor. This is an acoustic version of the song, with Brian singing the first verse and Roger the rest of the track. The 'Highlights' CD/DVD contains the full version of this track, but omits Roger's second 'alright' at the end. Chapter 26. Song length 4:40. Lead vocals by Paul Rodgers. This track has a longer intro to normal, to allow Roger to return to his drum kit. Chapter 27. Song length 7:14. Lead vocals by Paul Rodgers. The 'Highlights' CD/DVD includes an edited version of length 5:18, which loses the sections from around 2:11 to 2:35, 2:41 to 2:49, 2:52 to 3:24, 4:02 to 4:22, 5:36 to 5:53 and 6:16 to 6:33. Chapter 28. Song length 2:21. Lead vocals by Paul Rodgers. Chapter 29. Song length 4:32. Lead vocals by Paul Rodgers. The 'Highlights' CD/DVD includes an edited version of length 4:20, which loses the section from around 3:51 to 4:03. Chapter 30. Track length 1:09.